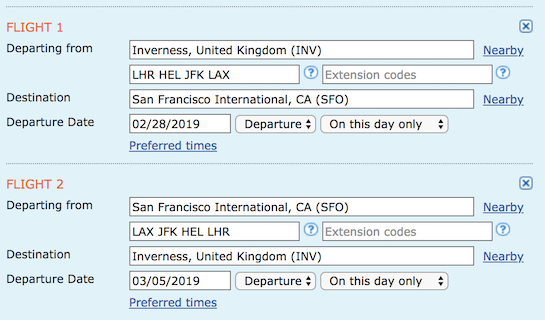 AA ticked INV-LAX/SFO-LAS in March, round trip. Usually two stops each way (LHR and an AA gateway), or one stop (LHR) for ~100GBP more. ITA Matrix shows all fares booking into I class. Two stops in LHR and JFK should get you 320TP each way, which should get you BA Silver in one shot. tbm13, upgradeyourtrip, SFO777 and 6 others like this. It does work open jaw, coming back to MAN. Has anyone been able to book AY's new A350 route to LAX for around this price? question guys, I have found INV- LAX-INV roundtrip via helsinki... BA 6000 but operated by finnair.. I will still get credit to my AA advantage? right? even i bought it in AA website but it is a BA flight number i will get a good eqd on certain route right? Any tips on how to get this on ITA? I've removed the stop limit but still only getting 2 stops. In advanced controls just enter the stops you want. INV - LAX on November 4 - 11th with `LHR HEL JFK SFO` in the first routing box and `SFO JFK HEL LHR` in the second. 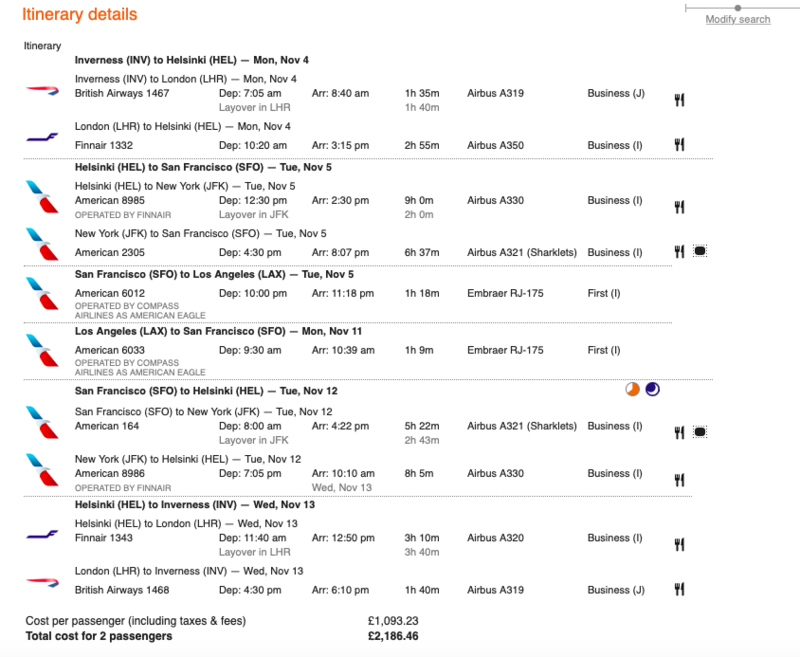 I found INV-LHR-JFK-LAX-LAS return for $1,207. I'm tempted to book this as I can actually use it to get home from a trip I've already partially booked and then return to Europe for my birthday. In advanced controls just enter the stops you want. INV - LAX on November 4 - 11th with `LHR HEL JFK SO` in the first routing box and `SFO JFK HEL LHR` in the second. josepciv and Thysk like this. dang..so two of these trips can get you BA- Gold which allow access to First class lounge when flying domestic in the US.. correct? josepciv and nickohrn like this. It's a broad sale - basically anywhere from UK to anywhere US. Sale in both J and F. Book by 1/31, avail scattered throughout 2019, but surprisingly good over the summer, a normally bad time for sales. Thanks. ITA server must be having problem. Keep on getting NO FLIGHTS FOUND. Start a new search! Location: Westchester Co, NY or Rio Grande Valley, TX or ??? FYI - it looks like this fare expires tonight, so if you're going to book this be quick about it!